D Rank- 100RYO or 2 posts training. C Rank- 200RYO or 3 posts training. B Rank- 300RYO or 4 posts training. A Rank- 400RYO or 6 posts training. S Rank- 600RYO or 8 posts training. SS Rank- 800RYO or 10 posts training. X Rank- 1,000RYO or 12 posts training. Name: A very straightforward description and understanding of this field in the jutsu template. The name of a jutsu is for identification purposes. If you want to include the Japanese name and kanji, that's fine- but please include the English translation as well. Also, please don't give jutsu misleading names, such as an Earth technique named after a water technique. Rank: The ranking field in the template is to determine the skill level and overall power of a jutsu. Rank and power are closely associated on Crisis, for the power of the jutsu reflects upon the rank of jutsu multiplied by your chakra stat. Please accurately rank all of your jutsu, and accept it if a staff member asks you to lower the rank of a jutsu. E Rank- E Rank jutsu are all supplementary in nature. They provide no significant change in battles, but they each have their own uses. Applied in the right situations, they can be even more deadly than a flashy high powered technique. Jutsu of this level are comparable to academy jutsu. Academy Jutsu do not need necessary skills to use(Such as a Bukijutsu user can still use Replacement Technique even without Ninjutsu skill). D Rank- D Rank jutsu are the basis of all forms and styles. They possess little to no power, but are slightly effective in combat depending on how they are used. D Rank jutsu are typically common knowledge to all Genin, with the exception of specific fighting styles. C Rank- C Rank jutsu is when your own personal skill starts to show. At C Rank, jutsu begin to show their deadly power and provide an average advantage during combat. C Ranks are comparable to Chuunin level skills and fighting styles. C Ranks typically make up the majority of a shinobi's arsenal. At C Rank, jutsu can begin to boost attributes sch as stats, but only one at a time and cannot be stacked. B Rank- B Rank jutsu are somewhat like your signature styles of combat. They are less common than C Ranks, but possess a decent amount of additional power. The skill level of B Rank jutsu are akin to the Special Jounin level. The creativity and complexity of the jutsu on this level far exceed the previous rank. A Rank- A Rank jutsu are usually game changers during mid-combat. The power these jutsu possess are tremendous and typically, there is no need to use a higher level of jutsu during missions or in battles against shinobi of the same rank. The skill level of these jutsu are akin to the Jounin rank. The creativity and complexity of A Ranks are superior to B Ranks, allowing for boosts of two stats and stacking. However, buffing two stats means splitting the total boost gained. S Rank- S Rank jutsu are considered the most powerful rank of jutsu. They are one's ace in the hole so to speak. Things can go badly very quickly and using an S Rank technique can completely flip a disadvantage into an advantage. The level of these jutsu are akin to a kage. S Rank jutsu are very deadly but also very costly on chakra, using them often will lead you to become fatigued rather quickly. This rank is as high as Non-limiteds can reach. SS Rank- Though S Ranks are considered the most powerful rank of jutsu, there are two ranks above S Rank which outstrip S Rank's potential. 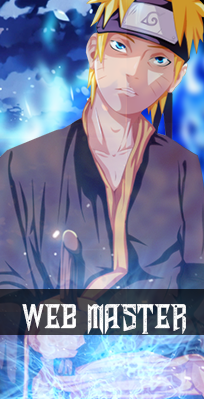 In terms of power, SS far surpass S Rank: though the chakra cost is exceedingly high as well. 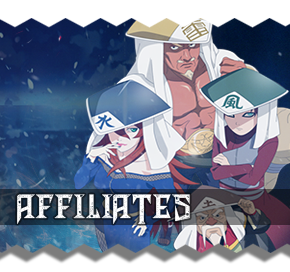 SS Ranks are akin to a Sannin. SS Rank jutsu should rarely be used, not simply for the drain in chakra... but because typically, these techniques have a lasting effect on terrain and people. Certain limiteds may be obtained at this level. X Rank- Lastly, the X Rank is the highest caliber of technique that one may possess. The power of X Ranks make SS Ranks seem shallow and are comparable to bijuu level. The chakra drain is frightening, but so is the power. Using a couple of these jutsu will leave you almost helpless on a battlefield if you don't end the conflict by then. X Rank jutsu have such high power or effects that it is quite difficult to compete with them. Certain limiteds may be obtained at this level. Specialty: Specialty or Type, is the field in which you include the necessary skills required to perform your jutsu. Fairly straightforward in understanding- if you are using a sword technique, then it falls under the Bukijutsu specialty. If you're using a melee fighting style with your fists, then its specialty is Taijutsu. If you're using a jutsu to heal someone's wounds, then your specialty is Medical Ninjutsu. Many of these specialties may be combined to do different things, but as a general rule: D-B Ranks may only use one specialty, while A-X Ranks may use two specialties. This applies mostly to custom jutsu, seeing as certain canon jutsu are known to use more skills. Canon jutsu will follow whatever approved skills they are posted as. Below are a few specific specialty restrictions. Generally, if the specialty specifies the ability to do these specific things, they are the only specialty capable of performing this feat. So please don't try making Taijutsu that can ward off poisons, or pure Ninjutsu that buffs your stats. Ninjutsu- Generally enables a shinobi to manifest chakra outside their body, such as elemental ninjutsu. Medical Ninjutsu- Enables a shinobi to heal the body, create/cure poisons & other harmful substances. Additionally allows the shinobi to create soldier pills for various effects. Nintaijutsu- This combined specialty of (Ninjutsu & Taijutsu) enables the shinobi to empower their own body through stat buffs, etc. Handsigns: Handsigns or handseals, are essential for most jutsu regardless of specialty. Handsigns are the channeling process of chakra molding within the chakra pathway system. Handseals draw forth the chakra, mold the technique according to the handseal and amount of handseals. The number of handseals required for jutsu vary, though a base amount is placed per rank. Additional handseals may be added, but not subtracted from the base amount. Very few jutsu excluding most Taijutsu and Bukijutsu techniques will not have handseals. The use of elemental techniques always start with the handseal associated with them. Rat (子, Ne): This hand seal is commonly affiliated with the special Shadow Techniques of the Nara clan. Tiger (寅, Tora): This hand seal is commonly affiliated with Fire and Earth Release. Snake (巳, Mi): This hand seal is commonly affiliated with Earth, Lightning, and Wood Release. Bird (酉, Tori): This hand seal is commonly affiliated with Wind Release. Dog (戌, Inu): This hand seal is commonly affiliated with Water Release and the movie-only Ice Release. Duration: Certain jutsu have instant cast and effect, while others have lasting effects over an extended period of time. The cost for both types of jutsu are the same, but the power of the jutsu will only be 1/2 the total power for duration types over every post they remain active. The half power can be strengthen for duration techniques by applying half of their ranked jutsu's chakra cost per post however. 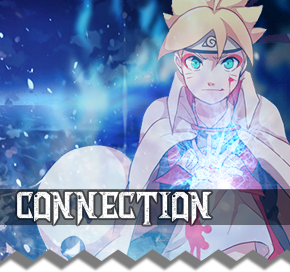 If using a B Rank duration jutsu & you desire or need full power per post, after the initial posts chakra cost, every post after that will require 50% additional chakra. In addition to this, certain ranked jutsu may only last for so long. Description: Shoots a ball of water. Effects: Wets the immediate area it makes contact with. Range: The range field of the jutsu template is very straightforward and simple to understand. All ranks of jutsu have a three stats that determine their full capabilities. Range is the stat which determines their maximum effectiveness based on total distance traveled. Ranges for ranked techniques can vary greatly depending on how the jutsu is created and jutsu power is divided. Depending on the nature of the jutsu, even a D Rank technique can have a longer range than an A Rank technique. Range is measured in meters. 1 stat point in Range correlates to one full 1 meter distance travel. That is for linear travel however. Circumference(AOE-Area of effect) jutsu that take up a whole field, cost a bit more in range. 3 stat points correlates to 1 meter AOE. Additionally, the size of certain jutsu can be increased the same way(Like increasing the fire of a fireball) This takes two sets of range. A) for total distance traveled. B) for size of fireball. Power: Arguably the most important part of a jutsu. The power stat determines the jutsu's overall effectiveness in terms of damage. Add plenty of points into the power stat if you wish to hit hard or apply certain effects with efficiency. Power stat is straightforward in that 1 point in power stat correlates to 1 point in jutsu power. Likewise, effects also operate on the same ratio. Speed: Speed, arguably lesser important than the power stat, but equally vital to actually hit the target. Without an adequate speed stat, your opponent could evade or even counter you. Add plenty of points into this stat if you wish to be more successful in hitting your target. Like the power stat, speed also applies a 1 to 1 ratio. 1 point in Speed stat, applies a 1 point speed increase to the jutsu. Most jutsu's speed do not reflect the user's own speed stat unless it is Taijutsu or Bukijutsu(not ranged bukijutsu). 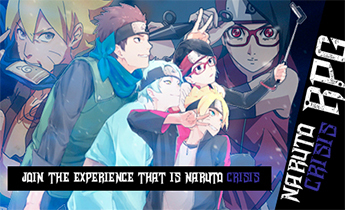 Description: Descriptions are very important when conceptualizing a jutsu. 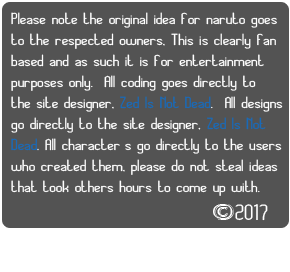 Not only does it help you create and get the jutsu approved. It also helps other readers(including staff) to understand the full appearance and effect of the jutsu. Be as descriptive as possible when creating jutsu. Please do not insinuate things that are not clearly there. If you do this, your jutsu will be approved without the subtle abilities or effects. Effects: The effects are somewhat tricky, yet also simple. The effects of a jutsu can range in many areas- such as a fire jutsu causing burning damage. A stunning jutsu to cause paralysis. A poisoning jutsu to apply poison, etc. Please note that in effects, the effectiveness of a jutsu's effect is determined by the power stat of a jutsu. In some cases, even the speed stat can be used. Requirements: This field in the template is both important and trivial. It is important for you to include any special characteristics which enable or disable someone from using the jutsu you've created. Such as needing a certain bloodline or Hiden.